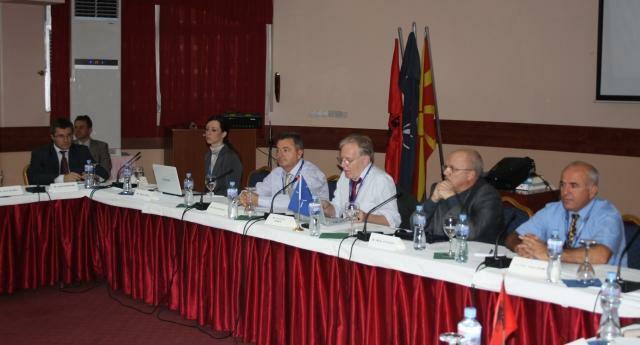 The NATO Advanced Research Workshop on Sustained Emergency Relief, organized by the Euro- Atlantic Council of Macedonia in Struga, Macedonia, gathered more than 40 participants from NATO, Macedonia, Albania, Bosnia and Herzegovina, Bulgaria, Greece, Croatia, Serbia, Slovenia, Montenegro and Turkey. Among them were representatives of public institutions, university professors and independent experts in the field of crisis management. The issues discussed during the second session ("Development of Regional Capacities for Emergency Relief in the Spirit of the Smart Defence Initiative") were especially interesting and relevant to the current problems facing every country nowadays - limited national resources and tight budget restraints. Col Prof. Mitko Stoykov presented Bulgaria′s contribution to NATO′s Smart Defence Initiative which is the establishment of a new NATO Center of Excellence – for Crisis Management for Disaster Response. In the beginning, he explained the background, main characteristics and objectives of the Smart Defence Concept. After that, he noted the three main prerequisites for the successful implementation of the Smart Defence Initiative′s objectives: cooperation, coordination and the communication. In his presentation, Prof. Stoykov thoroughly defined the nature of NATO′s Centres of Excellence and the principles for their functioning. Further, he explained the structure of the Crisis Management for Disaster Response Centre of Excellence and its operational platforms. In his second speech, Col Prof. Mitko Stoykov put the focus on Bulgaria′s crisis and emergency management capabilities. He mentioned briefly the legal documents which are the basis for the functioning of the crisis management system in Bulgaria. Col Prof. Stoykov continued with an explanation about the emergency management system in the country and its training and interoperability characteristics. Further, he noted the main issues concerning the cooperation between Bulgarian and Allied Crisis Response Systems. He concluded with outlining the problems that these systems were facing and the challenges lying ahead.